Looking for an ice breaker that actually breaks the ice? 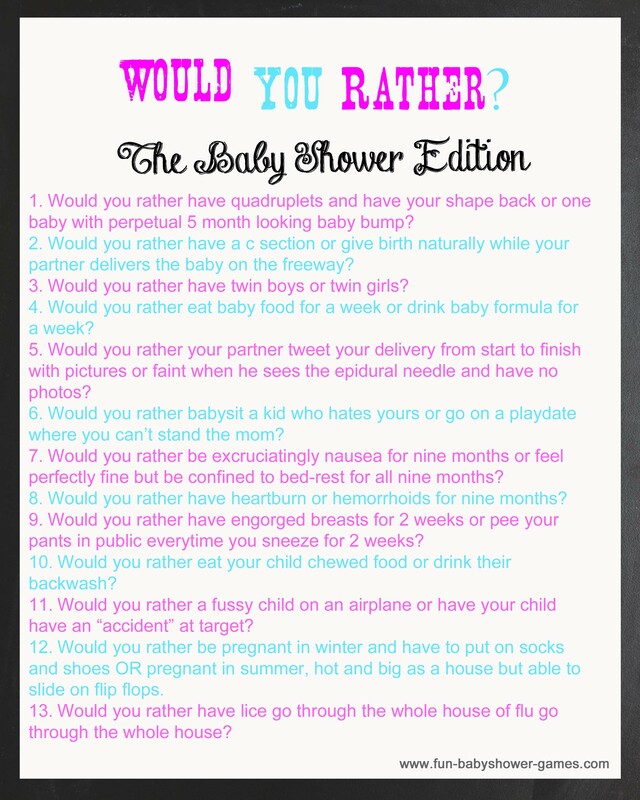 Well we got one for you- Would You Rather game, the baby shower edition. Here are some real life scenarios that as women we might find ourselves in. 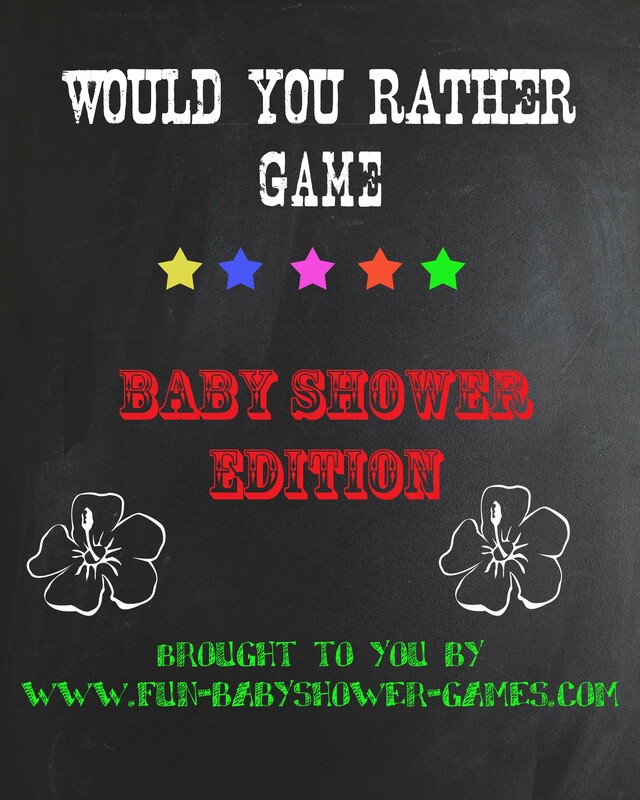 Some are downright painful to think about but would you rather baby shower game will give everyone something to talk, laugh or listen to. That’s why we recommend it as an ideal ice breaker. Don’t worry guys can play as well just simply ask them to pick an answer that they think their partner would choose, no doubt this will spark some controversy and you will find out how clueless or in the know the men are to what women go through during pregnancy. Hostess will read each question and select someone to answer. That person has to choose an answer. There are no winners just a lot of laughs. Choose one answer for each of the questions below. Would you rather have quadruplets and have your shape back or one baby with perpetual 5 month looking baby bump? Would you rather have a c section or give birth naturally while your partner delivers the baby on the freeway? Would you rather have twin boys or twin girls? Would you rather eat baby food for a week or drink baby formula for a week? Would you rather your partner tweet your delivery from start to finish with pictures or faint when he sees the epidural needle and have no photos? Would you rather babysit a kid who hates yours or go on a play-date where you can’t stand the mom? Would you rather be excruciatingly nausea for nine months or feel perfectly fine but be confined to bed-rest for all nine months? Would you rather have heartburn or hemorrhoids for nine months? Would you rather have engorged breasts for 2 weeks or pee your pants in public every-time you sneeze for 2 weeks? Would you rather eat your child chewed food or drink their backwash? Would you rather a fussy child on an airplane or have your child have an “accident” at target? Would you rather be pregnant in winter and have to put on socks and shoes OR pregnant in summer, hot and big as a house but able to slide on flip flops. Would you rather have lice go through the whole house of flu go through the whole house? The father to be has pregnancy symptoms. Would you rather he have mood swings or insomnia? Below is a printable version of the would you rather game. Just right click on the picture below to print.